It’s a little hard to believe, but we only have about a month left in the season. And, while the playoff field is far from set, we already have a pretty good idea of which teams will still be playing coming October. That fact got me thinking back to last year, when I looked at the championship droughts of the 2014 postseason. How does this season stack up to the rest of the wild card era? 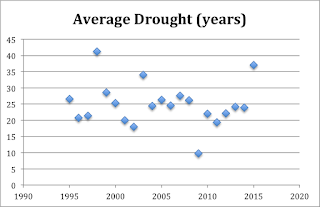 It’s not just the Cubs bringing up the average this year, either; removing them from the group still leaves an average drought length of over 29 years. Only that 1998 season had a higher average Series-less streak among teams. 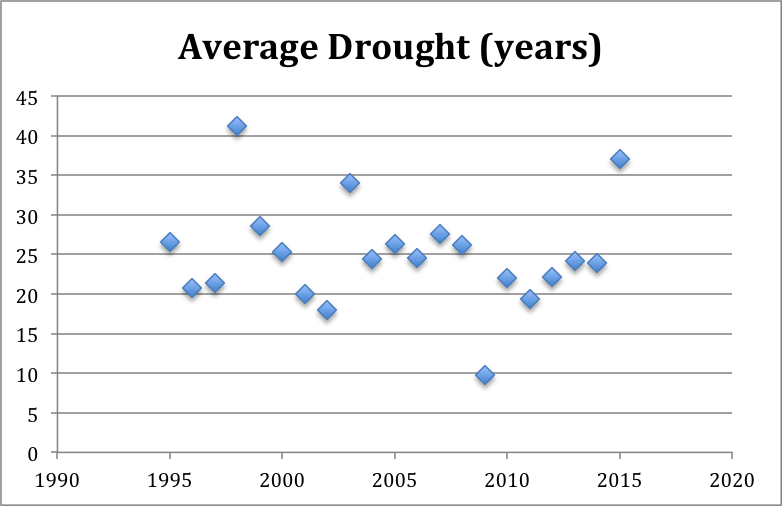 Once again, this year tops even last year’s incredible drought-busting capabilities, which originally got me to look into this line of inquiry. Although it’s funny, in retrospect, that both last postseason and that standout 1998 playoff ended with a champion only a year removed from their last titles (Giants last year, Yankees in 1998). Obviously, this year won’t follow that trend (given that the 2013 champ was the Red Sox), but will we see another year go by without a long drought ended? Another thing that I want to look at this year: how would this season stack up against that 1998 postseason if both had two wild card spots? Because I feel like this postseason’s potential achievement might be even more impressive given that there are two more slots to bring down the average. For those who don’t feel like looking it up, the 1998 teams included a lot of big droughts, including the Indians (1948), the Astros, the Rangers, the Padres (never, founded 1969), the Cubs, and the Red Sox (1918 at the time). A few more teams like the Yankees (1996 at the time) and Braves (1995), the seventh and eighth teams of the year, would go a long way to knocking that down a peg. As it turns out, the second wild cards in 1998 would have been the Blue Jays and the Giants, and while the Blue Jays’ 1993 win was a lot more recent back then, the Giants were in quite a drought of their own, dating back to 1954. 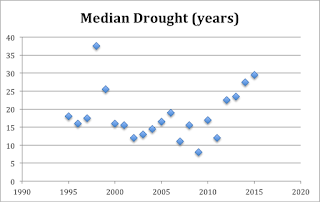 That means that the 1998 season still has an edge over this season, with a 37.9 average and a 37.5 median drought. Obviously, there are a few ways that 2015 could see its numbers change. If you want to root for more big-drought teams, your best options at this point are rooting for the Nationals (never, founded 1969) or for the Yankees to fall and the Twins (1991), Angels (2002), or Rays (never, founded 1998) to take their place. However, it’s worth noting that it seems just as likely for relatively-recent winners to knock out some big drought teams; the Giants are just as far out of their division as the Nationals are theirs, and the Yankees are the first wild card team, meaning both the mystery second team AND Rangers (or Astros, should they fall behind the Rangers) would need to overtake them. We probably aren’t going to see these numbers get too much higher. One other interesting point to note is expansion teams. I gave the run-down last year on how there’s never been an all-expansion team World Series before. 2014 was again a disappointment in this regard, as 3 expansion teams made it to October, but the Nationals lost in round one to eventual champs San Francisco, leaving the Royals no one to match up against after knocking out the Angels. 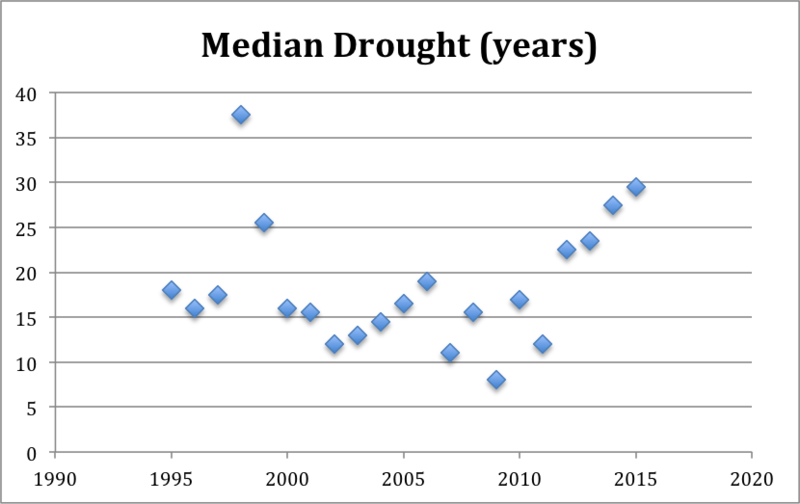 Is there a chance this year of the all-expansion drought to end? Actually, yes. If the standings hold as is, we’ll see the most expansion teams in the postseason we’ve ever seen, with five. However, the odds for an all-expansion World Series are much lower than you might think due to the distribution of those teams. Four of them are in the AL (Blue Jays, Royals, Astros, Rangers), meaning the NL representative will have to be whoever wins the NL East (the Mets are the only NL team, and even if they fall, the Nationals will take their place). By my back-of-the-envelope calculations, if you assume a 50/50 chance of winning each series (not the most accurate, but it’s pretty close), that gives us a roughly 22% chance of our first Expansion World Series. If anything changes, the odds are more likely to go down than up, seeing as the Yankees could win the AL East outright, or the Twins could overtake the Rangers. But there’s also the distant chance of the Angels or Rays and the Rangers passing the Yankees. Either way, I don’t see the odds staying between 19% and 22%, with the absolute minimum and maximum being about 15.5% and 25%. Either way, just at a glance, I don’t think our odds of an All-Expansion Series have been this good at the start of a postseason in nearly three decades.